Would you rather spend your days in an open, clean room with a fresh breeze or a dirty stuffy one? Would you prefer to sleep on Vita Talalay's ventilating mattress or on any other comfort material, such as memory foam? There are many different comfort materials out there. One aspect is the degree of ventilation and breathability. A ventilating mattress, topper or pillow has become one of the most important standards. This is because it brings many health and comfort benefits. We will explain why Vita Talalay latex is the best comfort material for ventilation, and ultimately health and comfort! Ventilation looks at how much air is able to flow through a material. Comfort materials also take a look at another aspect. It also looks at the moisture which is sent through the material. The moisture would otherwise build up in the fabric. Have a look at our video comparing the airflow between Vita Talalay latex ventilated mattress and memory foam! Why Is Ventilating Your Mattress, Topper, Pillow So Important? Having a highly ventilating mattress, topper and pillow is very important. This is because it greatly impacts your health and comfort. Finally, breathable bedding products contribute a lot to your quality of sleep. Ventilation impacts the so called “micro-climate”. In other words: the temperature and moisture management between the sheets and the mattress, topper or pillow. Without having optimal airflow through the mattress, topper or pillow, you may sweat more than you should. The correct word for this is called gas movement. Just like any other gas, water (or in this case sweat) vapor mixes with other gasses to disperse equally within the bedding product. The human body releases around a cup of sweat every single night. This is because of its own body heat. If the bedding products are not made of ventilating materials, then the amount of sweat will increase a lot. The sweat will build up in the bedding products rather than flow through. This has a significant impact on hygiene. This is because the mattress, topper or pillow will provide a great breeding and feeding ground for dust mites and bed bugs. Who really likes the idea of sleeping on old sweat and uninvited guests for 10 years or more? Fun fact: Did you know that our bodies cool down when we are about to enter deep sleep? The lowest temperature is reached at around 4 a.m. in the morning! Furthermore, the sweat and high temperature will also affect the durability of the mattress, topper or pillow. Over time, it will wear off the conventional comfort material, such as Dunlop latex or memory foam. With Vita Talalay latex this does not happen as fast. Conventional comfort material will begin sagging early. This will make the mattress, topper or pillow unsupportive, uncomfortable and unhygienic. We advise to change the mattress and topper every 8-10 years, and pillows every 3 years. However, we advise to do so earlier with other conventional comfort materials. Especially when the bedding products begin to sag, it is really high time to purchase a new mattress, topper or pillow! We recommend to give this article about buying a new mattress a read! Also keep in mind that the sweat will also lead to the bedding products having an unlikable odor. The ventilation in a mattress, topper or pillow is highly comparable with a nice shower. Imagine now what it would be like not to shower for a long period of time – would you want to miss out on a shower for 8-10 years? If you are interested in buying a bedding product which will always be clean, smell fresh, is soft yet supportive and finally durable, please continue reading! We will now explain why Vita Talalay latex is perfect for you! What Are Direct Negative Effects Of a Non-Ventilating Mattress, Topper Or Pillow To Your Comfort And Health? There are many more negative effects of sleeping on non-ventilating mattresses, pillows and toppers. The increased temperature and moisture within the bedding products may lead to an increase in blood pressure, heart rate and even irregular breathing. At worst, this may lead to waking us up several times a night. It is simply not an optimal sleeping environment! This way, our sleep will not give us the rest and rejuvenation that we need. Instead, it becomes tiring. This will of course lead to performance issues. Both physically and mentally throughout the day. Vita Talalay latex on the other hand, will always make sure to prepare you for every new challenge! The unhygienic conditions within the mattress, topper or pillow will create the perfect new home for critters. In this case, we are talking about dust mites and bed bugs. These unwanted guests feed off of sweat and dead skin which the body sheds during a night’s sleep. The additional warmth created by low ventilation creates the environment that they need to breed! What happens in a humid and warm room which has not been ventilated for a while? Right! It starts to get moldy. The exact same may happen to any of your conventional mattress, topper or pillow! According to the CDC (Center for Disease Control and Prevention), having mold in your living areas may cause many bad reactions. These include nasal stuffiness, coughing or wheezing, throat irritations, eye irritations, and even skin irritations. For those who suffer from any lung conditions, the effects may be even worse. Another side effect which conventional mattress, mattress toppers and pillows have is the forming of mildew. Thanks to the increased moisture and heat within the mattress, topper or pillow. Since mold and mildew mostly differ by color, the health effects of mildew are the same. Mold and mildew are even worse for infants and children. This is why we highly recommend changing the mattress, toppers and pillows by latest when the bedding products begin to sag! Remember that these changes to the conventional mattress, toppers and pillows happen under the covers. Although they still may look great, the inside may be very different! Why Is Vita Talalay Latex So Ventilating? Many believe the pin holes in the material are the reason for its ventilation. The pin holes you see in the image below are not the reason for Vita Talalay latex mattresses, toppers and pillows to be highly ventilating. The pin holes are actually to make sure that there is an even temperature distribution within the mold. This counts for the freezing stage at -30ᵒC/-22ᵒF and the pre vulcanization stage at +115ᵒC/+238ᵒF! Without the pins, the latex will not “bake” evenly. This will have an impact on the quality of the final product. Mostly in terms of ventilation, comfort and durability. However, some comfort material manufacturers make use of the popular myth. Sometimes, pin holes are drilled into the final product. They are then sold to consumers while claiming that they are highly ventilating mattress, toppers and pillows thanks to the pin holes. Keep this in mind when you are looking for a new mattress, topper or pillow! Now, after having uncovered the popular myth, let us talk about the ventilating properties of Vita Talalay latex! It all boils down to the production process. In comparison to any other type of latex comfort material, such as Dunlop latex, the production process of Vita Talalay latex is much more complex. Conventional Dunlop latex does not undergo vacuuming, freezing, gelling and post vulcanization. Thanks to the unique production process of Vita Talalay latex, the final product will have an open, round cellular structure. This allows air to flow through the high end natural comfort material. In addition, the open, round cellular structure also brings many other benefits. Those include being soft yet supportive, being more hygienic, durable, and being cool in summers and warm in winters. For a full overview of the benefits of Vita Talalay latex, we recommend to give this article a read! We also recommend having a look at our video about the unique Vita Talalay latex production process. Click here or have a look at our production process page! 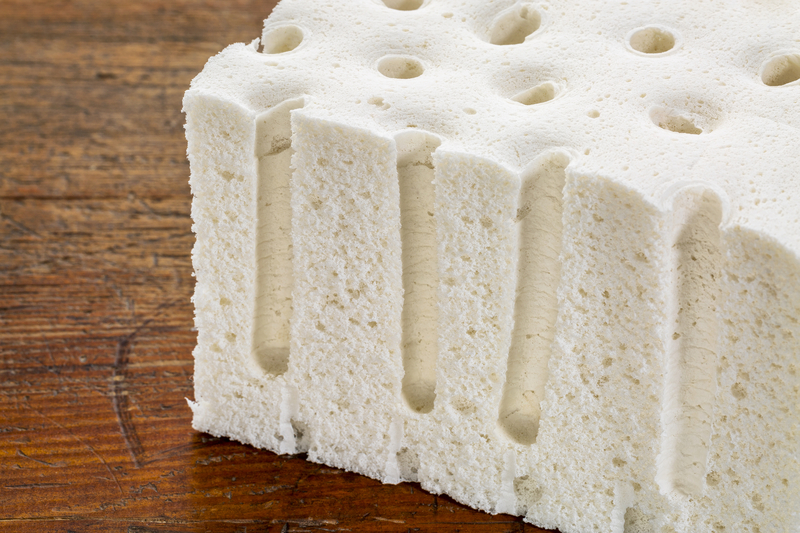 This last part of the article will show the main difference between conventional Dunlop latex, memory foam and Vita Talalay latex in terms of ventilation. As mentioned above, the main difference between Vita Talalay latex and other comfort materials is the open, round cellular structure, which provides the pure natural comfort material the benefit of optimal ventilation. This is clearly visible in the image below – have a look for yourself! There are many different reasons why Vita Talalay latex is superior to conventional Dunlop latex. Said reasons include added pressure relief, dust mite resistance, the fact that it is more durable, as well as being fully natural. Most importantly for this article is the fact that Vita Talalay latex is significantly more breathable than conventional Dunlop latex. Apart from the unique round, open cellular structure which allows optimal airflow, the conventional Dunlop production process also has another downside. Namely, that the Dunlop latex creates a skin over the Dunlop latex material which significantly decreases the ventilation. Just as above, Vita Talalay latex is superior in many ways. Memory foam gives near to no support, gets hard when it is cold and soft when it is warm and disperses your energy. Keep in mind also that memory foam is purely synthetic as opposed to the pure natural Vita Talalay latex. If you look close enough under a microscope you may even still be able to see petrochemical oils between the uneven cells. In terms of ventilation, memory foam is the least breathable of all three comfort materials. This is due to the fact that it is the densest material out of the three. In fact, Vita Talalay latex is up to 25 times more breathable than memory foam – his video illustrates perfectly! This leads to the micro-climate to be about 4ᵒC/7ᵒF warmer on average in comparison to Vita Talalay latex. The increased temperature and moisture within the bedding products may lead to an increase in blood pressure, heart rate and even irregular breathing. At worst, this may lead to waking us up several times a night. The increased temperature and moisture within the bedding products may lead to an increase in blood pressure, heart rate and even irregular breathing. At worst, this may lead to waking us up several times a night.